George DeAngelis passed away quietly yesterday. George's name is not well know in the Model T community. He was much better known in the Model A community, where he did extensive research on how the Model A was built. He was a well known author in his own right. Each of us in the old Ford hobby owes George a debt of gratitude, because it was George who together with his friend and collaborator Ed Francis took it upon themselves to salvage all of the engineering parts drawings, releases, and other related materials when they were otherwise headed for the dumpster in the early 1980s. The materials they saved include the parts drawings for almost every FMC vehicle from the original Model A through the V8 era, including the Ford Trimotor. Virtually all of the recent research that Bruce McCalley, John Regan, many others, and myself has been based upon the engineering documents collection that George donated to the Benson Ford Research Center in the later 1990s. Although this collection's official title is Accession 1701, those of us who have worked with this collection fondly refer to it as the George DeAngelis accession. George was was an excellent machinist as well. All three of the reproduction Ford Quadricycles were built by George. He could legitimately claim that he had built more Quadricycles and had more experience with them than Henry Ford. One of my favorite memories of George DeAngelis is from about 15 years ago. At that time I was struggling to learn how the Ford Factory Symbol Number (part number) system worked so I could find the documentation for the parts I was researching. Once in frustration I said to George "I don't know how anyone could ever figure out how the system worked!" George's patient response to me was "Well, Trent, If you had been brought up in the system you would know how it worked." While his answer at that time was not particularly satisfying, he was right. I have now spent enough seat time working with the collection at the Benson Ford to know how the factory symbol number system works, and how to find the records on the parts I am interested in. I have an original copy of the 1963 June edition of Popular Science in which his article on the 1896 Quadricycle and him building it appeared. That article inspired my Dad to build a replica. It went down the street under its own power in 2001. I would like to back up Trent's comments. 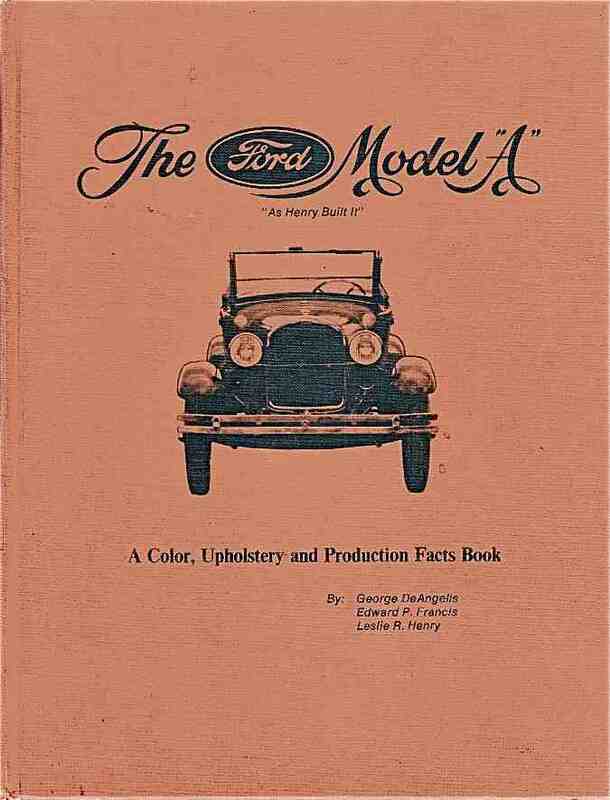 In the early 1970's I bought the book " The Ford Model A" As Henry Built It. That book was invaluable when I helped my Dad restore one of the first Model A's built here in Australia. You could tell that his articles published in Model A Magazines " The Restorer " were well backed up with thorough research also. His legacy will live on and he will long be remembered. Yes I too have the same book with the remains of the paper cover on it. It was truly my "bible" and I read it from cover to cover several times while working on my (and other) A's. He will be missed by Ford enthusiasts around the world. Thank you Trent, for the news. My condolences to his family and friends. I am sorry to hear of George's passing. I met him at the archives and just remember thanking him for what he did to preserve information that to me is as alluring as pure gold. I just found the Ford drawings as being as addictive as any opiate. We owe him so much. You said it best - we are certainly diminished. We have lost a Great One. His legacy does live on though. I have a few of his books in my library, since I started out with a Model A.
I had the pleasure of hearing him speak about his experiences in making his first reproduction quadricycle. He had just completed it and spoke of his first attempts to develop dimensioned drawings based solely on observations taken through the glass showcase that the quad was housed in. He developed a clever scale factor, based on observed dimensions taken from outside the glass and how far he estimated that particular feature to lie from the glass surface. After several days of this curious activity, museum officials got to wondering what he was up to. When they learned what he wanted to do, he was given direct access to the car, which I imagine was more than helpful to him. After hearing him speak, I was very impressed and inspired by his talents. I never really knew him but I guess I could say he made a positive impression on me and I have fondly remembered his talk and the wonderful workmanship of his finished product. He is one of a handful of guys that showed me what can be done by just one guy, with a bit of talent and a lot of patience and perseverance. Combined the 2 posts and corrected the spelling of George's last name. Never met him but I share John's sentiments exactly. I have been able to spend many happy hours at the Archives because of Mr.DeAngelis. Those of us for whom "correct" is a way of life owe this man a large debt indeed. Deep condolences to his family. I am currently building a Quadricycle replica using his original plans....wish I could have met the guy. Chris Branaccio - thank you for correcting my mistakes. I'm very saddened to hear of this. I knew George for many years through my work at the Henry Ford and the Old Car Festival. I was always an admirer of Georges' abilities and demeanor. George was at the OCF in 2013 and was pretty frail then. I think it was his grandson that approached me to ask if George could get a ride in the replica quadricycle George built and that was being driven at OCF (as it usually is -- that's the kind of meet it is!!). His grandson said, in so many words, that this could be his last OCF. Well, it went without saying that, of course, George could get a ride. So, I arranged for George to take a ride (his last?) in one of the Quadricycles he built. And I was glad to do it. From way down here in little old New Zealand I too am saddened by his passing. I spoke with George when I was researching the origins of the Quadricycle we had in New Zealand, that was in my care a few years ago. I gather he lived in Detroit in the warmer months, where he worked as a volunteer at The Henry Ford; in the winter months he sensibly found warmer climes (Florida?). I really enjoyed talking with him; he was clearly a lovely man.